Who knew that George Washington was born on February 11, 1732 but that because eleven more days were added to the calendar in 1752 George’s birthday was celebrated on February 22. What? Eleven days were added to the calendar? Who did this–and why? But that’s a subject for another day. For now, let me suggest that instead of “President’s Day” we actually celebrate George’s birthday today: February 22. The day he celebrated it after 1752. I had no idea that George Washington spent most of his life in pain from rotting teeth. 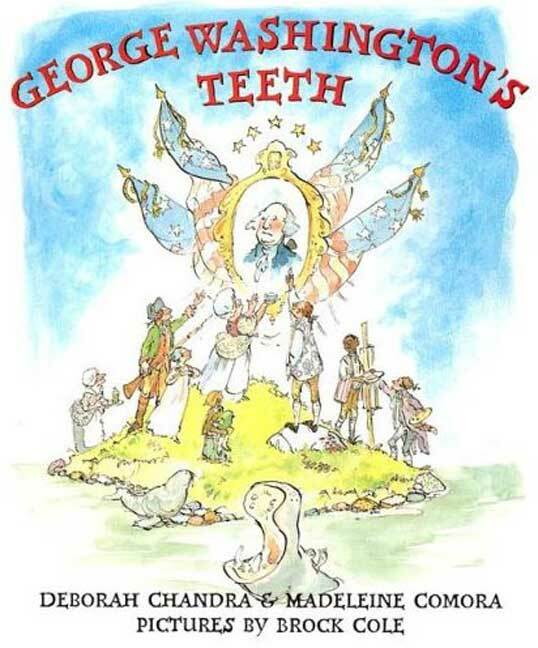 Of all the books about Washington I found the quirky George Washington’s Teeth the most fascinating. The rhyming text of this picture book is fun and skips along like a song. The back story, revealed through letters and journals of Washington himself, which are the final pages of the book, show our first President suffering throughout his life with bad teeth. This book is written for two age groups: the rhyming, playful text that young children listening will soon be able to memorize and the back pages that are a timeline of Washington’s life. For example, an excerpt from his letter to a friend, inquires about a dentist: “ ‘…Having some teeth which give me a great deal of pain…’ He then crosses out the words ‘give me a great deal of pain’ and writes instead ‘are very troublesome to me at times.’” Troublesome to say the least! In 1776, when Washington posed for Charles Winston Peale’s famous portrait, old root fragments embedded in George’s gums were causing him great pain. Looking closely, one can see a scar on his left cheek from an abscessed tooth. In his later years dentures contribute to his deafness and constant gum infections are a factor in his death in 1799. The younger child will enjoy the text and need not read the historical timeline in the back. But when older children discover how Washington suffered, the timeline can be an impetus for more study of what treating illness was like over 200 years ago. Today we fight over the issue of health care, but this information should give us all pause. Speaking as someone who suffered from an infected abscessed tooth, I couldn’t get to the dentist fast enough. I’m thankful I wasn’t born when George was.